It is the best of times, it is the worst of times, it is the age of wisdom, it is the age of foolishness… it just depends on which tower you live in. The UOAQ has access to the audited financial statements of two different bodies corporate occupying adjacent towers. For the sake of sensitivity, we will call them T1 and T2. Both shared the same Caretaker/Rental Pool Manager (RUM) inherited from the original owner. Automatic extensions granted for any top-up requests from the RUM. It is understandable that in their early years both T1 and T2 followed similar paths regarding the day-to-day management of their respective bodies corporate. Relevantly, their annual levies steadily increased at about the same rate. For many years, there was very little to distinguish T1 from T2 when comparing their Admin Levies on a ‘per lot per annum’ basis (PLPA). T1 stuck to the traditional way of doing things, and their levies continued their upward trajectory. T2 adopted a different approach, which produced immediate reductions in their levies. There soon emerged a discernible gap between their respective Admin Levies on a PLPA basis…and the gap has continued to grow. The committee at T2 developed a culture of questioning the old ways and exploring new and better ways. The body corporate at T2 was presented with a golden opportunity by their RUM, and they seized it with both hands. The UOAQ has for many years recommended that rather than simply renewing service contracts from term to term without testing the market, all service providers should be required to compete for the new contract. This includes the BCMs. The T2 committee put the BCM contract to tender, inviting quotes from a number of BCMs. The incumbent BCM, although not the cheapest, was eventually awarded the contract on a ‘value for money’ basis. Relevantly, the incumbent BCM’s quote was much less than what the body corporate had been paying them for years. Making them compete does make them competitive. The body corporate gained a significant on-going saving, and in the process let their incumbent BCM know that renewals should not be taken for granted. The UOAQ also has recommended for many years that the BCM should be separated from the ancillary services often provided by BCMs: it is better to source these services directly from third-party, independent experts. This includes strata insurance. Accordingly, the T2 committee engaged Strata Insurance Solutions (Insurance Brokers) to source quotes from a wide range of strata insurers. As may have been expected, the incumbent insurer was not competitive. It would be an understatement to say the committee was somewhat taken back by just how uncompetitive the incumbent insurer was: T2 saved $20,000 in the first year. The body corporate gained a significant saving, and in the process acquired a truly independent insurance broker they could trust to test the broad market each year for the ‘best value for money’ quote. BCM’s fees and the strata insurance quotes are just two examples of what a sharp, questioning committee can achieve by always looking for opportunities to achieve the very best for their lot owners. The UOAQ understands this culture is alive and well at T2. The Caretaker Fee is normally the largest single item paid out of the Administration Fund each year: usually around 35% of total payments. For many years, neither T1 nor T2 were an exception to this general rule. Like so many complexes, T2 had a long history of top-up requests from their RUM. Unlike so many complexes, T2 had an equally long history of saying NO to these requests. In 2016, with only three years of the caretaker’s contract remaining, T2 was advised that their mortgagee-controlled RUM wished to surrender the remainder of the contract. Negotiations were then entered into between the relevant parties. Enter into a fresh three-year contract with a new RUM selected through a tender process on the open market. In return, the new RUM agreed to heavily discount the annual Caretaker Fee by about $125,000. This meant the $230,000 settlement fee would be recouped in the first two years of the 3-year contract, resulting in an even larger net reduction in the Admin Levy in the third year, and thereafter. It was also agreed the annual Caretaker Fee would be tied inversely to the level of the rental pool: the bigger the pool, the lower the fee. As the RUM builds up the rental pool thereby making more money, this allows the RUM to charge the body corporate even less for the caretaking duties. This new arrangement means that T2 has been able to stem the growth in their Admin Levies. While so many things are getting more and more expensive, and much of this is beyond anyone’s control, it is useful to have a committee which looks very closely at those expenses which they can do something about. T2’s Admin Levies have gone up by 9% only, while their Caretaker’s Fees have dropped by 54%. The upshot is that you can put a $$$ value on a sharp committee. One of the first questions asked of any real estate agent selling a unit concerns the annual levies. 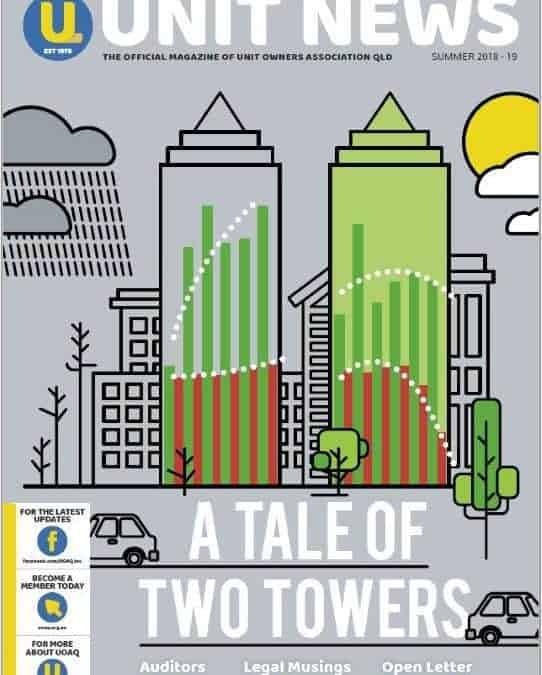 It is little wonder that when comparing similar units in similar towers, the one with significantly lower levies will prove more attractive to the purchaser…and this will be reflected in the sale price. As the levies come down, the value of the units goes up.